The coal industry's hope of a recovery is now all but over. 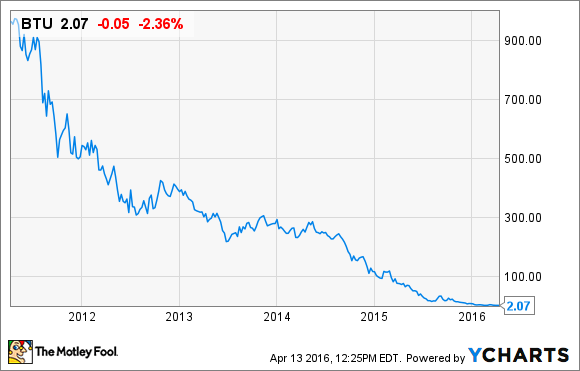 On Wednesday, Peabody Energy (NYSE:BTU) at last gave in to the financial pressure that's been crushing the coal industry for nearly a decade. Following the bankruptcy of Arch Coal, Alpha Natural Resources, Patriot Coal, and Walter Energy, Peabody is the biggest U.S. producer and finally gave up on a coal recovery. Maybe April 13 will be known as the day coal in the U.S. is declared officially dead. Regulation and the onslaught of renewable energy are often blamed for the fall of coal in the U.S., and in some ways that's true. But the real driver of coal's demise has been cleaner, low-cost natural gas. Data source: U.S. Energy Information Administration. Chart by the author. As recently as 2006, coal generated 49% of U.S. electricity, compared to 20% from natural gas. In 2015, coal had fallen to 33% and natural gas was up to 33% as well. Compounding slumping demand in the U.S., China and India, which were supposed to pick up the slack in demand, are turning their back on coal. Beijing will shut down the last four of its coal power plants this year and at least 1,000 coal mines this year. As the biggest installer of both wind and solar electricity in the world, China is betting on cleaner sources of energy to power the country and clean up its horribly polluted air. India's coal use is soaring, but domestic production is filling the gap, and as a result, imports are collapsing. In the last nine months of 2015, coal imports dropped 15% and that trend shows no sign of slowing. With domestic demand falling and international demand failing to pick up the slack, there was nowhere for the coal industry to go but down. And it was a fast and furious drop once it started. The writing has been on the wall for coal for years. In 2011, I wrote about how coal was losing market share to natural gas and renewable energy. Those trends only accelerated in the five years since. The price to frack for natural gas has been falling and the cost to produce energy from wind or solar energy sources has been dropping like a rock. What place does coal have given those market trends? If there's one thing investors can learn from the fall of Peabody Energy and the coal industry in general it's that long-term trends matter. Coal has seen costs rise as regulation made running coal plants more expensive and few new plants were being built. Natural gas and renewable energy have seen the opposite with costs falling and that's where the money has flowed as well. Coal isn't completely dead in the U.S. and still supplies a lot of electricity. But from an investment perspective, it's a dying business and now is the time to start looking to the future of energy for your investment ideas. The past is long gone.